Lenovo is on a mission with the ThinkPad. It's a mission of not just making the Chinese vendor's business-bent laptops thinner and lighter, but simpler, more stylish and more versatile. One of Lenovo's recent attempts at modernizing the brand is the ThinkPad T440s, a 14-inch professional grade ultrabook that sacrifices little, if anything, to meet Intel's standards for ultrabook status. But is this ThinkPad enough to rattle the competition, namely the HP ZBook 14 and 13-inch MacBook Air? This laptop certainly tries to, but quickly loses its ultrabook status in that effort. The T440s comes packing a 1920 x 1080, 10 point multi-touch IPS panel, fingerprint reader and hot swappable battery technology before clicking the "Checkout" button. This is all crammed inside a slick, smooth carbon fiber and magnesium frame at a mere .80 inches thin. That's certainly a start. Sadly, this laptop lacks the dedicated graphics processing of the ZBook 14 and the whiffs on the pure portability of the MacBook Air in attempting to match its longevity. Aside from hinges that can bend 180 degrees, the T440s doesn't have many tricks up its sleeve. This is no ThinkPad Yoga, but it's far from bare bones. With carbon fiber wrapping the notebook's clamshell lid and keyboard deck, and magnesium covering its base, this ultrabook more than delivers as far as connectivity and security are concerned. In addition to the hot swappable batteries and fingerprint reader the T440s sports three USB 3.0 ports, VGA, mini DisplayPort, Ethernet and both SIM and SD card readers. Between that and its FHD touch display, this laptop already gives the thinner and lighter (though smaller) MacBook Air a run for its money in some regards. Like Lenovo's ThinkPad X240 and T440, the T440s was built with two batteries: a 3-cell juice pack on the inside and your choice of an external 3-cell or 6-cell battery. Thanks to Lenovo's Power Bridge technology, you can swap batteries on the fly without shutting down the machine – as long as the internal battery has power, of course. While the technology nearly defeated the purpose of the X240's 12.5-inch form factor, it makes at least a little more sense on a rig that's 14 inches and inherently heavier. Lenovo promises up to 17 hours of life out of this laptop with the 6-cell battery attached. I didn't witness quite as lengthy a show of endurance, but it was nevertheless impressive. Daunting displays of lasting power aside, there is one important consideration to keep in mind, the 6-cell external battery immediately shatters the T440s's ultrabook classification, adding an additional 0.43 inches to its thickness. Not to mention that the extra juice bumps this laptop's weight from an already-dense 3.9 pounds (thanks, touchscreen) to a hefty 4.2 pounds. That puts the T440s in an interesting position. It's heavier than most other business-friendly laptops, but it offers longevity superior to most laptops in any category. 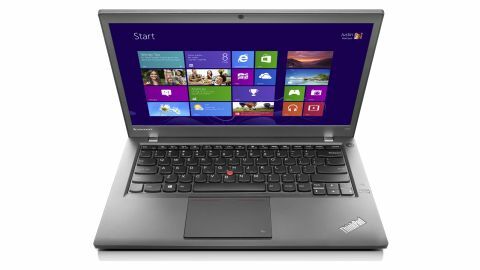 As important as it is today, endurance isn't everything, so let's take a closer look at what else the T440s offers.